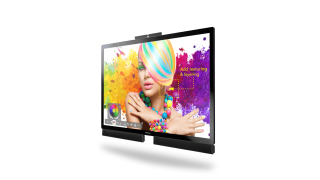 The What: InFocus has unveiled its new 70-inch Mondopad Ultra touchscreen collaboration system. The all-in-one video conferencing, interactive whiteboarding, presentation, and data sharing display for teams is designed to provide easy collaboration across the conference table or across the globe. 70-inch Mondopad by InFocusThe What Else: The InFocus Mondopad all-in-one system is designed to enable teams to connect and share any type of content with local and remote audiences. Offering the capabilities typically provided by multiple devices in traditional conference rooms, Mondopad is an enormous touch-enabled screen that combines an HD video conferencing system, an interactive whiteboard, a 4K presentation screen, audio conferencing, and a powerful PC. "There's nothing more valuable than people working together,” said InFocus CEO Mark Housley. “Now, more than ever, teams are spread around the globe and enabling them to collaborate effectively is paramount. At InFocus, we're creating solutions that make this connection not only possible, but better. The new 70-inch Mondopad Ultra is the next evolutionary leap forward in our award-winning Mondopad product line. It brings premium technologies, including 4K resolution and projected capacitive touch, to the Mondopad product line that has enriched operations in enterprises, governments, and educational institutions around the world for more than five years." Able to perform a myriad of functions, Mondopad allows team members in multiple locations to see and hear each other while brainstorming on a shared whiteboard and to collaboratively edit documents and draw directly onscreen enabling real-time collaboration and more effective meetings. Documents can be saved to the Mondopad for future access, stored to the network, or emailed to anyone directly from the device. A built-in high-quality camera and speakers facilitate enterprise-grade videoconferencing, making Mondopad the standalone collaboration system that connects people, devices, and information easily and reliably right out of the box. The new 70-inch Mondopad Ultra is the first InFocus Mondopad to employ both projected capacitive touch and 4K screen resolution. Projected capacitive touch, the touch technology that is used on leading smartphones and personal tablets, eliminates the need for a stylus and enables a more intuitive and natural user experience. Unlike IR touchscreens, capacitive touch technology allows more touch points with faster response and bezel-free edge-to-edge glass, allowing for a brighter and sharper display, a sleek industrial design, and remarkably fluid multi-touch capabilities. In addition to 4K resolution and capacitive touch, the new 70-inch Mondopad Ultra runs Microsoft Windows 10 Pro, and features a sixth-generation Intel Core i7-6700T processor and Q170 chipset with Intel vPro technology, with 8GB memory and a 256GB solid state hard drive. The Mondopad Ultra seamlessly and securely integrates into existing enterprise infrastructure. Supporting SIP and H.323, Mondopad Ultra is compatible with legacy video conferencing and display hardware and software, including Skype for Business and many third-party room video conferencing systems. Advanced wireless casting, including support for AirPlay, Chrome, and Miracast, allows presenters to share content from their laptops, mobile phones, and tablets without using cables or dongles. Mondopad Ultra offers the security features native to Windows 10 Pro. "An all-in-one system that makes collaboration easy is a competitive advantage," Housley said. "We've upped our game by creating this premium Mondopad Ultra solution that not only performs all the functions needed to collaborate, from whiteboard to web, to videoconferencing, but also provides game-changing intuitive touch and Ultra High Definition 4K video for the highest level of performance for teams who need to connect to get their jobs done." The Bottom Line: The feature-rich 70-inch Mondopad Ultra combines projected capacitive touch technology with 4K screen resolution resulting in high image clarity, sleek industrial design, and intuitive multi-touch capabilities for professional and education environments. It will be available for $13,999 MSRP in October.